Disasters-natural or man-made-can wreak havoc on your IT infrastructure and severely impair your ability to conduct business. Even a minute of downtime on a single server can cost millions in lost revenue. Fortunately, virtualization enables hardware independence that prevents the effects of server downtime caused by any type of disaster in your datacenter. 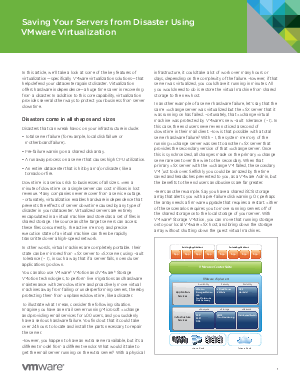 Learn how VMware virtualization solutions can help you address disasters quickly and easily. This white paper takes an in-depth look at some of the key features of virtualization that help defend your IT environment against disaster.